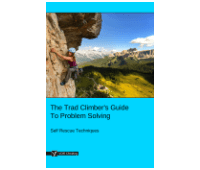 How To Abseil Past a Knot is part of the e-book - The Trad Climber's Guide To Problem Solving. As always, first try to utilize the terrain to make passing the knot easier. 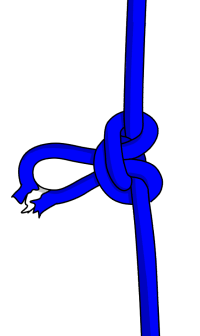 For example, if you have a ledge to stand on, you can bypass the knot without needing prusiks. 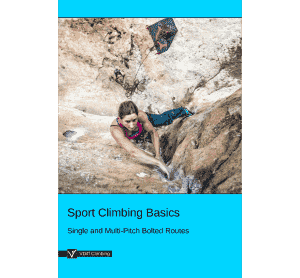 However, if you are dangling in space with a heavy pack pulling you backwards, you’ll need to follow all the steps described. 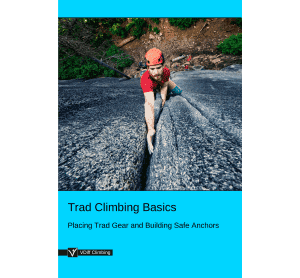 Stop abseiling when your prusik is about 30-40cm before the knot. Allow the prusik to take your weight. If you are abseiling without a prusik (not recommended), you can wrap the rope around your leg a few times. This adds friction but does not lock your belay device, so make sure to keep hold of the rope for the next couple of steps. And use a prusik next time. If your belay device jams into the knot, you’ll need to ascend a short amount. Pull up about two meters of rope and fasten a back up knot (clovehitch or figure-8 work well). Attach this to your belay loop with a screwgate carabiner. Fasten a prusik above your belay device (classic or autoblock types work well) and attach it to your belay loop with a short sling. Abseil down a few inches to allow your weight to be taken by this prusik. Detach the un-weighted lower prusik from your leg loop but keep it in position on the rope. 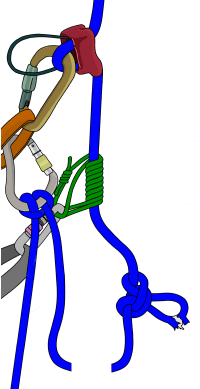 Remove your belay device and reattach it to the rope immediately beneath the knot. 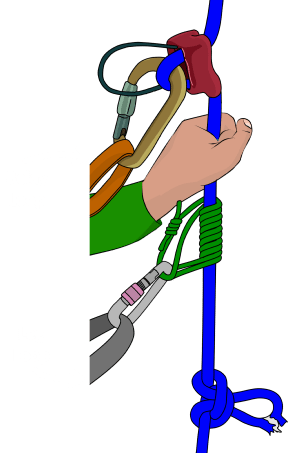 Lock your belay device by tying it off with a mule-overhand. Clip a short sling to the lower prusik. Stand in this sling to un-weight the upper prusik. Remove the upper prusik and sit back to weight your tied-off belay device. If you can’t weight your belay device from this position, you may have to down-prusik a couple of times until you can weight it. Alternate between weighting the upper prusik and standing in the lower foot loop. Adding an extra sling to the lower foot loop makes this easier. 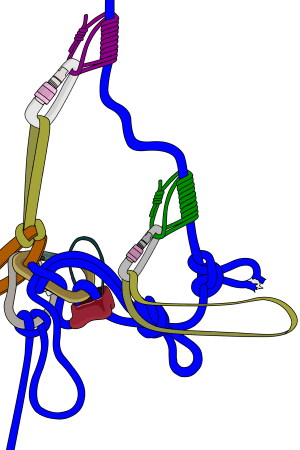 Reposition the remaining prusik back to your leg loop (without the foot loop sling), unfasten your back up knot and then release your tied-off belay device. You can now continue your descent. The same technique can be used when abseiling with an extended belay device. During step 6, you will need to down-prusik a few moves to ease your weight onto your tied-off belay device. 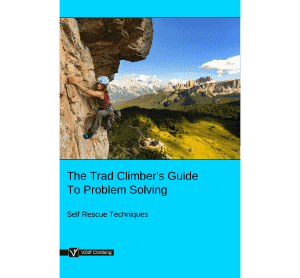 If you know there are knots in the rope before you descend, you can speed things up by abseiling with a pre-attached prusik above your belay device. There are many variations of this same technique. 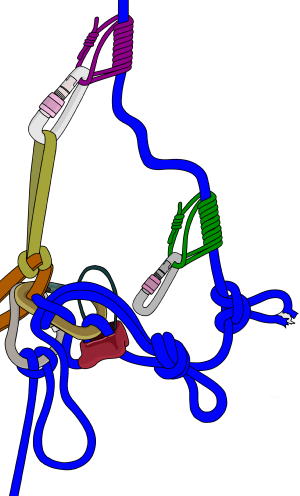 The most important thing to remember is to fasten a back-up knot before you detach your belay device. It’s highly recommended to practise this technique before you actually need to use it. Dangling in space with your belay device jammed into the knot and a prusik out of reach above is a common error for first-timers. 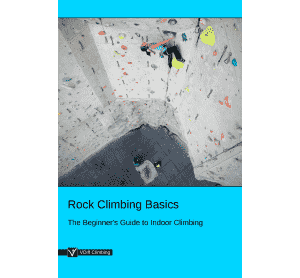 Try it out on different angles of rock, with your prusiks at different heights and attached to different lengths of sling.